ARLINGTON, Texas — The message for all those young Michigan players was clear in the letter from a 13-year combat veteran that coach Jim Harbaugh read to them the night before the first game. “Just to hear that letter and say, OK, there’s 18- and 19-year-old guys going over there defending our freedom, why can’t we step out onto the field … and play a simple game of football?” quarterback Wilton Speight said after the 11th-ranked Wolverines beat No. 17 Florida 33-17 on Saturday. Quinn Nordin, in his first college game, became the first Michigan kicker to make two 50-yard field goals in the same game, freshman Tarik Black had a 46-yard touchdown catch and the overhauled Michigan defense didn’t allow a touchdown while handing Florida its first season-opening loss in nearly three decades. Michigan trailed 17-13 at halftime before scoring three times in the first 6 minutes of the second half. The Gators had won 27 consecutive season openers, the nation’s longest such streak, since a home loss to Mississippi in 1989. After Karan Higdon’s 3-yard TD run capped a half-opening 75-yard, 10-yard drive, Ambry Thomas forced and recovered a fumble on the ensuing kickoff. That set up a 30-yard field goal by Quinn, who then made a 50-yarder after Michigan recovered another fumble. “This win was a good start for the season for us, build our confidence, allow us to see what we’re capable of,” sophomore linebacker Devin Bush said. Florida’s only touchdowns came when Duke Dawson and CJ Henderson returned interceptions for touchdowns. Those came on consecutive throws by Speight in the second quarter. Nordin made four field goals, including a 55-yarder in the first half. He missed two attempts wide right in the fourth quarter, one of those from 52 yards. The nation’s No. 1 kicker in the 2016 recruiting class, Nordin had initially committed to Penn State but signed with the Wolverines after a home visit that included a sleepover by Harbaugh. 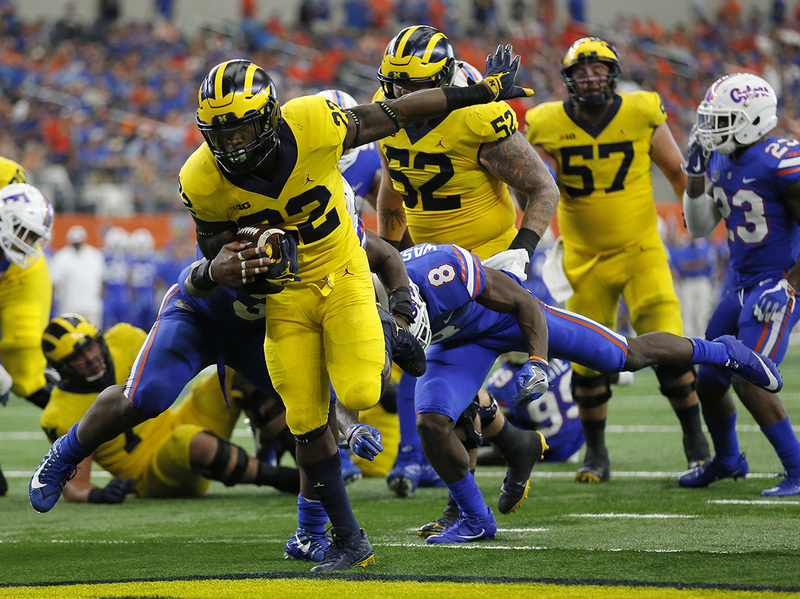 MICHIGAN: While the defense has been greatly overhauled — remember, there were eight Michigan defenders drafted off last year’s unit — the Wolverines limited Florida to 192 total yards (only 11 yards rushing). They even scored a late touchdown on a sack that resulted in a fumble recovered in the end zone. Aside from the interceptions on consecutive throws, Speight was 11-of-23 passing for 181 yards with the TD to Black.